How is this for a set of steps? They need replacement. 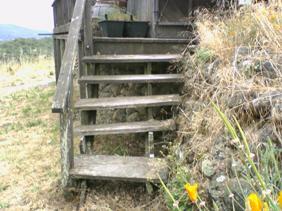 These steps failed because the foot of the stringer was resting on bare earth. When the wood rotted away, the steps crumbled. To install these properly, footings need to be added at the bottom of the steps. A post for the railing was sunk to provide extra stability for the steps and rail. This job required two trips to complete. The first trip was to remove the old steps, prepare and pour the concrete. The second to build the steps. 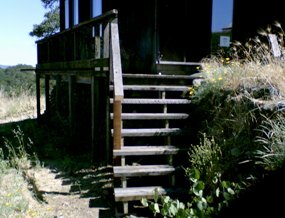 The railing and the step surface materials were build using recycled redwood from a dismantled water tank. I want an estimate for a straight run of stairs 48″ wide, railing on both sides, going 10′ up from a concrete patio to an upstairs deck. Material: redwood. $2000-3500 easily in 94930 and the surrounding area built to 2016 IRC and local codes. Poured landing w/footings or poured footings @3000 psi or better under the bottom two guard posts. Strong-tie attachments to upper deck and footings. Epoxy-coated steel screws minimum, 305 or better stainless preferred.